Believe the hype. “Mad Max: Fury Road” is one of the most ferocious, heart-stopping, breathtaking movies ever made. When previews for this film started appearing several months ago, they looked amazing, but I stopped short of getting my hopes up because I’ve seen countless terrific, expertly edited trailers for films that wound up being much less than the trailers promised. Then the reviews started pouring in and not only were they rapturous, they were better than most serious Oscar-contender films usually receive. Again, I tempered my enthusiasm, because even mass critical opinion can be wrong. But I was beyond pleased to see that not only did “Fury Road” live up to the hype, it exceeded it on many levels. As much as director George Miller redefined action films with the first two “Mad Max” films back in the late 1970s / early 1980s, Miller tops himself with “Fury Road” with some of the most brilliantly staged action sequences I’ve ever seen in a motion picture. I could try to describe what Miller does here, but it would sound lame, if not ridiculous or cheesy. What Miller does here could have gone disastrously wrong, but he pulls it off beautifully. Trust me, you just have to see the film to know what I’m talking about. A big part of Miller’s success is due to Margaret Sixel’s wonderfully insane editing. If there’s a shoe-in for an Oscar this year, it’s for Sixel. The biggest surprise about “Fury Road” is that while Tom Hardy’s titular character Max Rockatansky is in almost every scene of this film, Charlize Theron’s Imperator Furiosa character is the heart of the film. Theron’s performance is not only the equal of Sigourney Weaver’s Ripley from the “Alien’ franchise (the gold standard of female action characters), Theron exceeds the very high bar set by Weaver. Furiosa is a character that has been living her entire life facing unspeakable horrors to not only gain the evil leader Immortan Joe’s trust, but to use that trust to escape Joe’s reign of terror and gain the freedom for Joe’s multiple concubines. This is someone who has been operating on slow burn for multiple decades, someone who has had to keep her emotions close to her vest to risk her life to save the lives of others. Theron’s character is not only brave, but is someone who has to constantly improvise when things don’t go according to plan. If Theron does not receive an Oscar nomination for her performance in “Fury Road,” if not the win, it will be a grave injustice. And this is not to slight Hardy’s performance as Max in the least. Hardy is a more than worthy substitute for Mel Gibson who justifiably became a star after his turn in the first two “Mad Max” films. Hardy portrays the right mix of bravery and insanity that we expect of Max. But despite the “Mad Max” title of the film, this is really Furiosa’s story. While Max (again) learns to regain his humanity, I hope this won’t be theme of future Max installments. If both Gibson and Hardy can sell us on the fact that they’re not numbed-out nihilists by the end of “Road Warrior” and “Fury Road” respectively, hopefully whatever screenplays accompany future Max films will take the character further instead of repeating the formula again. But again, this is not to slight “Fury Road.” This is the first Max film in 30 years and if we need to be reminded of the original trope, that’s fine. Just please, Mr. Miller, take the character further in future installments. I’m afraid if I say anymore, it will dilute your enjoyment of “Fury Road” if you haven’t seen it yet. Despite the unanimous critical praise, please note that this is an extremely violent film and if you are queasy about such things, you will not like this no matter what praise I or others bestow upon it. But I will say that the hype is justified and “Fury Road” is a film for the ages, if not a classic. In the introduction to “The Horror of it All,” author Adam Rockoff admits he’s attempting to do for horror films what Chuck Klosterman did so expertly with his debut book “Fargo Rock City” for heavy metal music: provide a combination memoir / detailed analysis of a favored … and here’s a word that Rockoff detests … “genre.” And I’m happy to say that Rockoff’s book is the equal to Klosterman’s brilliant and immensely entertaining debut book. 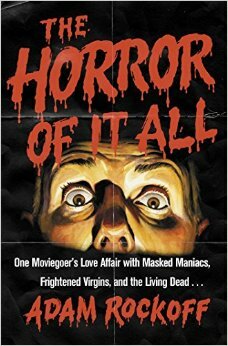 Regardless of whether you’re a fan of horror films or not, “The Horror of it All” is an incredibly fun and thought-provoking read. I don’t agree with all of Rockoff’s assertions here (though to be fair, I haven’t been much of a horror fan since the 1980s), but you don’t have to be a horror fan to groove on the depth and passion with which Rockoff discusses horror films and American culture. And while you may disagree vehemently with what he has to say, the man undoubtedly knows his s–t and can talk about it in a way that kept me riveted for its nearly 300 pages. Yes, horror fans may find a lot to quibble with here, since Rockoff gives contrary views of such horror classics as “The Exorcist,” “Alien,” and “Halloween.” Film snobs may disregard Rockoff’s serious discussion of films like “My Bloody Valentine” and “The Burning.” But I welcome a sincere and intelligent discussion of any film, especially if I think a particular film is crap (mainly because I’m one of the worst offenders of rushing to judgment on most topics). One of the highlights of “Horror of it All” is a chapter that takes down Siskel & Ebert’s legendary condemnation of slasher films, point by point, as if Rockoff is Jim Garrison analyzing the Zapruder film of J.F.K.’s assassination. Also welcome is his objective analysis of the clumsy marriage of heavy metal and horror films, as well as the P.M.R.C. hearings of the mid-1980s. Rockoff actually made me feel sympathy for Tipper Gore for the first time, even though he obviously disagrees with her position. There’s a lot to chew on here, but if you have an open mind and a good sense of humor, this is a marvelous and very smart critical look at horror films. Dave says check it out! Here’s an early, rawer version of “Can’t Hardly Wait” that was originally intended as a song for the Replacements’ 1985 album “Tim” but was later reworked into a much slicker version for 1987’s “Pleased to Meet Me” … with the requisite horn and string section that was de rigeur for 1980s major label rock recordings. All I can say after hearing this earlier naked version is “Holy f–king s–t!” This was a great song even with the “slick” arrangement, but hearing it without all the polish is revelatory.